Last week mindfulness expert, Heather Stang, introduced us to the Three Part Breath for mindfulness. Today she’s going to expand that with two more practices; Mindfulness Meditation: Breath Awareness and Mindful Journaling. All of these are part of the Week 1 Exercises from her book, Mindfulness and Grief, and are a great starting point if you are interested in bringing the benefits of mindfulness into your daily routine. There are several ways to practice mindful meditation. This week you will use your breath as the object of your meditation practice. To whatever extent it is possible, let your focus be on your breath. You may be able to stay in contact with your breath for only one inhalation, and minutes later realize that your mind has wandered off in a daydream. This is not only normal, but also common, and to be expected. Once you become aware that you have drifted off, simply start again without judging yourself. Do this again and again as often as is necessary. The first time you practice, you may want to set aside only five or ten minutes. Eventually, you may decide that you want to sit for 45 minutes or more. TIP: This is not always a linear practice, so you may move around from one instruction to another depending on how you feel. 1 Establish your posture and bring yourself into the present by checking in with the seven points of your body. 3 Bring your attention to your belly and chest and see if you can feel the sensation of your breath. 4 Bring your attention to your nostrils and see if you can feel the sensation of your breath. Notice the length of your inhalations and exhalations without trying to change them. Feel the places in your body where your breath is most noticeable. Observe the temperature, flow, and texture of your breath. 6 When you find you have lost track of your breath, just start again with the next exhalation. 7 If you feel you have reached a point of concentration, try to open up your awareness to include all your bodily sensations, your thoughts, and your feelings without engaging them and without pushing them away. If you get distracted or “hooked,” simply return to your breath and start again. 8 There may be a point when you feel you can drop all techniques and simply be present to what is happening in each moment as it unfolds. You will record your experiences in a Mindfulness Journal. This will be a private place for you to explore your thoughts and feelings without fear of judgment by others. I recommend being traditional and using pen and paper; this will allow you to write in your designated practice space without having to “plug in.” Since most of us spend 40 hours a week or more using a computer, using a pen and paper won’t feel so much like work. Some weeks you will be provided with a starting point in the form of a question or suggested exercise. As with all practices in this book, you can choose to respond literally or choose your own path. 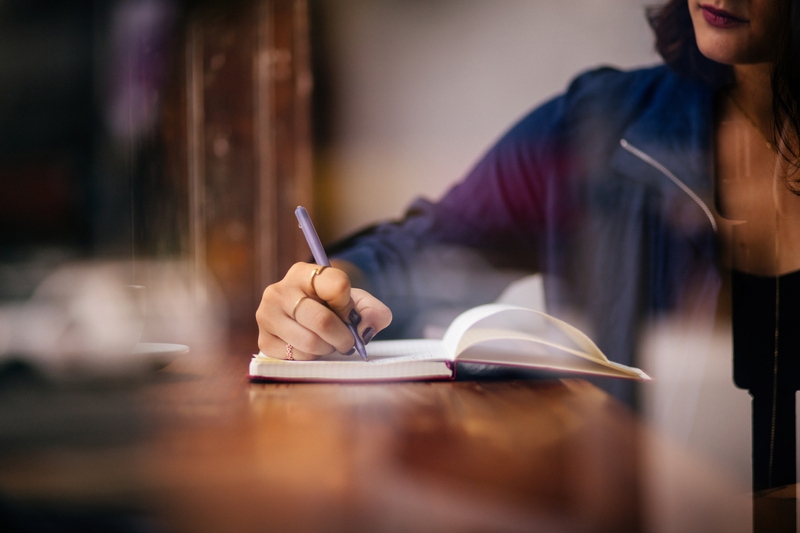 You may decide to write more often than once a day, or even to carry your Mindfulness Journal with you wherever you go, and write when the mood strikes. What to do if emotions get big while writing Mindful journaling is one of the most revealing practices I have experienced personally and in my Mindfulness and Grief groups. There may be times when you feel overwhelmed with emotion when writing in your Mindfulness Journal. You have two options: you can continue to write or you can stop. If you continue to write, use your breath and six senses to link your awareness to the present moment. Although you may be writing about a memory, or a vision of the future, it is important that you are aware that you are writing about it in the present. Feel the pen in your hand; see the paper. Experience the sensations arising in your body. Observe how it feels to tell your story while simultaneously experiencing profound emotion. Notice the emotion as it rises, passes, and eventually fades away. If you choose to stop writing, bring your attention to your breath and your six senses. Remember that you are in the present moment, and always be compassionate to yourself. Before you begin writing, pause and notice your breath and body. Be aware of all six senses as you write. Write continuously and keep your pen moving. This will allow you to witness the continuum of your experience. You do not have to write fast—but try to write without stopping. If you do not know what to write, write “I do not know what to write.” If you find yourself repeating a sentence or word over and over again, that is fine too. Do not worry about the content of your writing. Insights will develop naturally and without effort. Do not erase, delete, or cross anything out. If you feel the urge to do so, notice that urge and get curious. You may even wish to write about your “inner editor” in your Mindfulness Journal. Keep your journal in a safe place or password-protect the computer file, if you choose to type instead. When you finish writing, notice your breath and your body. Complete the exercise with mindful awareness. Grief Compass wants to offer a huge thank you to Heather Stang for allowing us to share these instructions with you. Both of these practices are absolutely worth giving a try, they are free and easy. If you want to explore more deeply how mindfulness practices can be incorporated into your grief experience, Heather has an incredibly insightful book, Mindfulness & Grief, she also has a podcast you can subscribe to, as well as online meditation courses. But we hope what we’ve given you here is a good starting point for allowing a little bit of mindfulness help you through your grief.